Have you heard of the FRANK debit and credit card by OCBC? They're not your regular, boring and common cards that everyone seemingly owns.. You get to choose what design appears on your card!!! 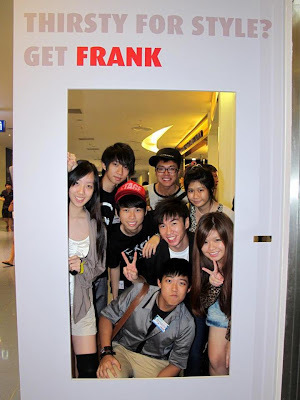 So just a few weeks ago, a FRANK branch opened in Vivocity! It's their first off-campus branch. (other branches include NTU and SMU) *you can apply for a FRANK debit/credit card from any OCBC outlets, not just FRANK stores! Cool "vending machine" outside their Vivocity store to select your card design! Some of the awesome designs showcased! "All I speak are words of wisdom, young one..."
For the ladies with candy-coated lips! We signed up for debit cards! Simply email me on which design you like and why and win a Dempsey Hill voucher! Have fun with OCBC FRANK cards! Many banks sweet talk, but only one is FRANK!